Today’s estate in the Upper Village area of Montecito, California, was inspired by the large country estates of the northern Mediterranean. Behind dual wooden gates, the motor court is a fitting welcome to a timeless home with newly built detached sun-drenched studio. 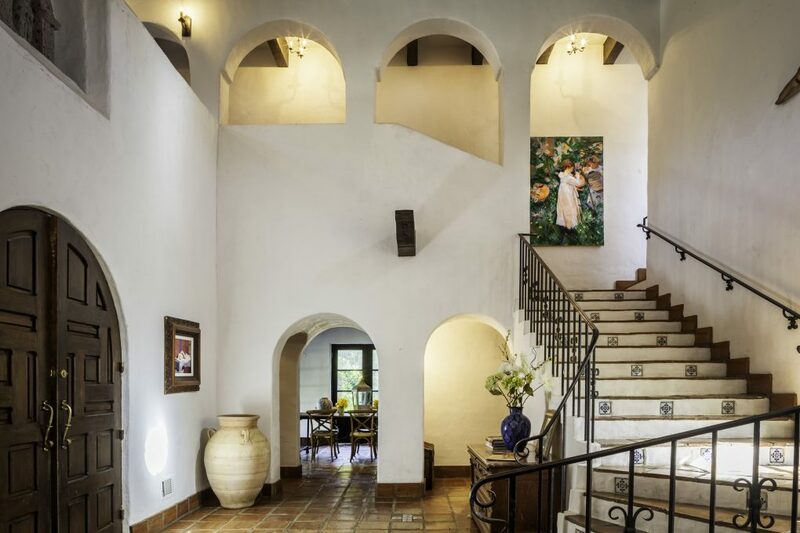 White stucco, Saltillo tile floors, hand carved wood beams, ornate wrought iron, imported tile, and arching paned windows adorn each space. In the dramatic foyer, a wide graceful staircase ascends to the master suite, two bedrooms, and two baths. The soothing sound of nearby church bells can be heard daily adding an ambient echo of the European countryside. 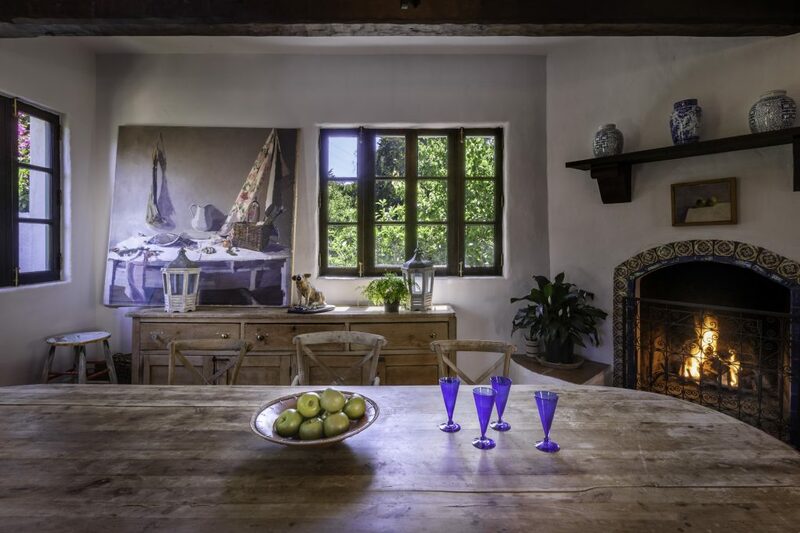 French doors in nearly every room lead to numerous balconies and patios offering garden views and mountain vistas. There are four fireplaces including one in the library that is an ideal and practical office. The formal dining room conveniently connects to the side patio. Upstairs, the master suite is a romantic retreat with mountain and garden views stream and French doors that open to two balconies. Adjacent is a charming sunrise-facing bedroom with shared access to the master bathroom. The third upstairs bedroom suite features a brand new bathroom with marble counters. Sharing the motor court is the new studio with kitchen and bathroom. Two sets of large barn doors add an indoor-outdoor feel. A sloping ramp leads from the patio behind the studio offering easy access to the main house. 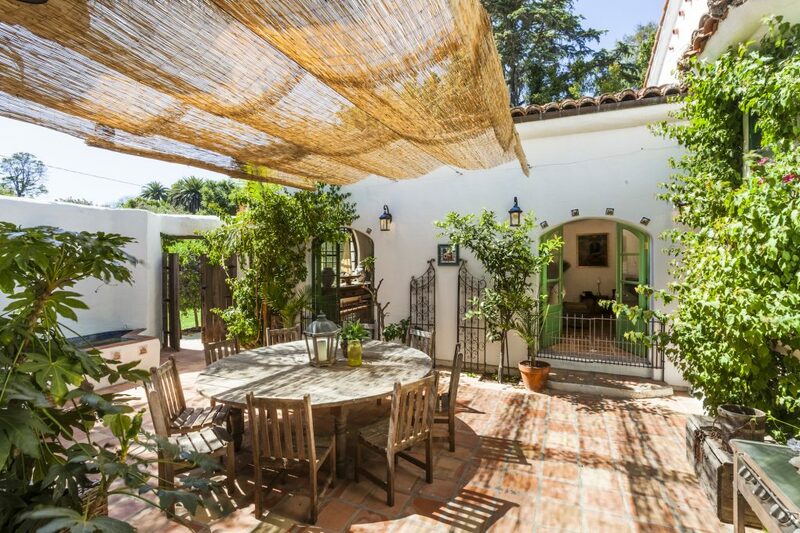 The central courtyard with fountain is an enchanting outdoor room off the kitchen and living room. Lush grounds include fruit trees, gardens and an expansive lawn. 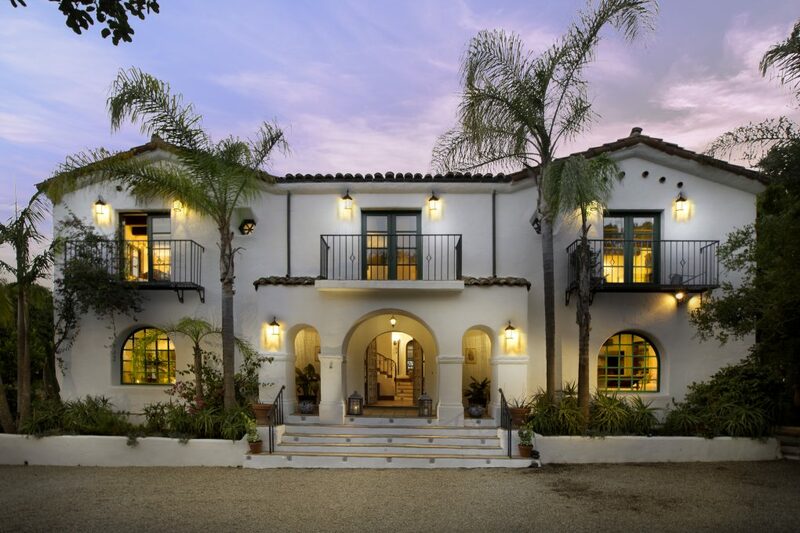 This home is listed for $2.795 million with Village Properties and is showcased by Luxury Portfolio.